“However educated the people may be they still feel timid telling their loved ones about their problems,” says Nadia, a breast cancer survivor who lived with the disease for six years before finally overcoming it. “After my son’s birth, I knew something was wrong. When I went to the doctor, the mammogram procedure scared me. I didn’t get it done until much later.” Nadia’s cancer was diagnosed at the second stage. She had to go through, chemotherapy, radiations and a mastectomy before she was cancer free. Many due to lack of awareness and societal taboos surrounding the disease in Pakistan have to face severe consequences. Women fear coming out about the disease as talking openly about one’s breast is still considered disrespectful, as the fear of losing breast in the process is overwhelming, dreadful thoughts of an unhappy marriage due to it or no marriage at all; ignoring the big picture, i.e. their life, in the course. Every year in October, International Breast Cancer Awareness Campaigns (BCAC) are run with the month dubbed Pinktober. BCAC which started in 1985 has saved many lives with the aim of the campaign to promote the most effective ways in the fight against the disease. Breast cancer has become relatively curable in the past years. Early detection could increase survival rate, mean lesser chemotherapy and no mastectomies at best. “Breast Cancer is not a death sentence anymore. It is 100 per cent curable if women get tested on time,” Dr Maryam Hassan a researcher at Shaukat Khanum Memorial Cancer Hospital and Research Centre (SKMCH&RC) told Pakistan Today. 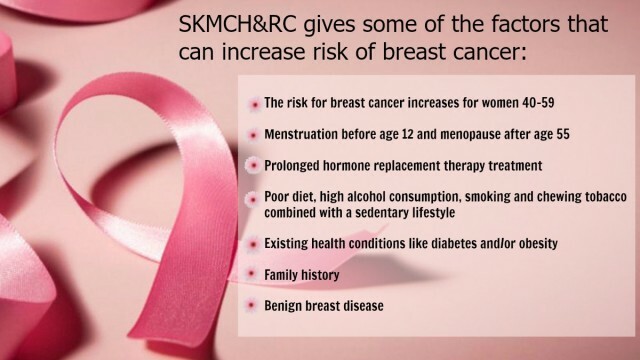 Almost one in every nine women in Pakistan is vulnerable to breast cancer in her life while over a million women worldwide are diagnosed with the disease every year, according to SKMCH&RC. The lack of awareness related to the disease in immense in Pakistan. Belonging to the advantaged class people think that they have enough knowledge to detect breast cancer, but sadly that isn’t the case. “At the moment we need to focus on educating the educated in the country because we need to break the taboo first of not talking about this disease and of course we hope for a domino effect,” Hadiqa Kiani said while talking to Pakistan Today, the famous singer is also an ambassador of Breast Cancer from SKMCH&RC. “This, though, is important for every class of the society. We being the more privileged one have a greater responsibility to understand and spread the word about the disease. Besides if we do not do it who will?” says prominent actress Mahira Khan, who is also an ambassador for breast cancer awareness with SKMCH&RC. Breast cancer can be a result of many environmental and inherited risk factors. With the development of technology which can study DNA of cancer cells more closely, understanding of the biology and genetics of breast cancer has vastly improved. Through this advancement, new therapies for breast cancer are being introduced, giving hope to breast cancer patients. Since the early 1990’s death rates from breast cancer have decreased by approximately 25% in the USA and Europe. Screening mammography and continuously improving treatment strategies which utilise chemotherapy, hormone therapy and, more recently, targeted therapy have made this possible. Dr Maryam Hassan says symptoms of breast cancer vary from person to person. She said that it is important for every female to self-examine once a month and search for the minor changes occurring in the body and share any change with the doctor. She emphasised that early diagnosis and treatment is the key. 1) With your arms at your sides. 2) With your arms overhead. 3) With your hands on hips – Press firmly to flex your chest muscles. 4) Bent forward – Inspect your breasts. A woman has many roles to play in the society, namely of a mother, daughter, sister, etc. In the cycle of life women usually forget that they are the core of a family, which brings onto them another responsibility, i.e. to take of themselves even more. “As women, we are so sensitive to everything, everyone’s issues but ourselves. We forget to take care of ourselves. We actually are the nucleus of our family,” Hadiqa Kiani said during one of her workshops. “If we take care of ourselves, we could do a better job. So get checked. Be aware and do it as soon as possible,” she continued.